Arriving at the beach, two minutes away from the cottage. 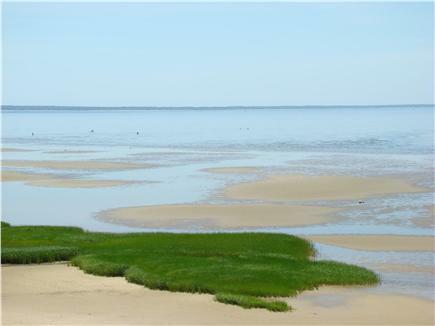 Low tide at the Bay! View from the beach, with the stairs in the background. Located on a private sandy lane in the woods, our cottage is just a minute away from a beautiful, private Bayside beach. 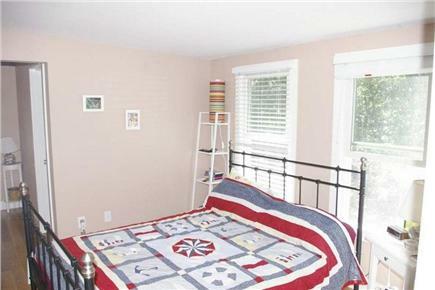 Our cottage was expanded and fully renovated in 2011. It can accommodate up to 4 persons: a family with young children or people looking for a quiet cottage in the woods near the beach. 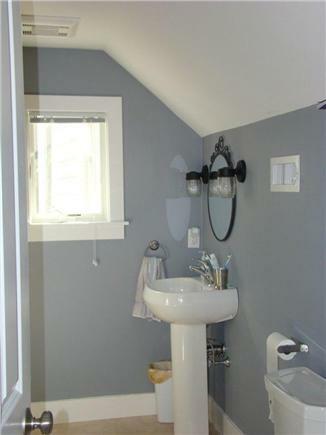 Our cottage can also accommodate two couples as the two bedrooms are separated by a mezzanine and offers three bathrooms. 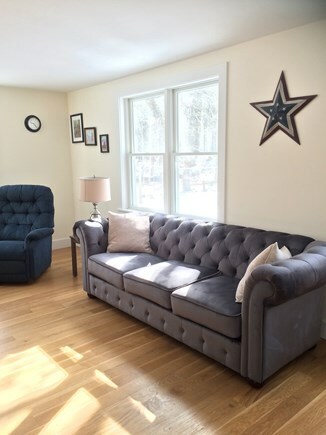 Our two story cottage includes on the first floor a kitchen, living - dining area, a den with a queen sofa bed along with a bathroom (with a shower stall) and a laundry room. On the second floor, you will find a mezzanine and two bedrooms, each with a queen bed and a bathroom with each bedroom (one bathroom with a shower stall, the other with a bathtub). 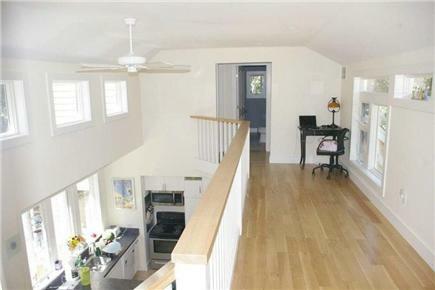 Hardwood floors and numerous windows add brightness and light to the cottage. 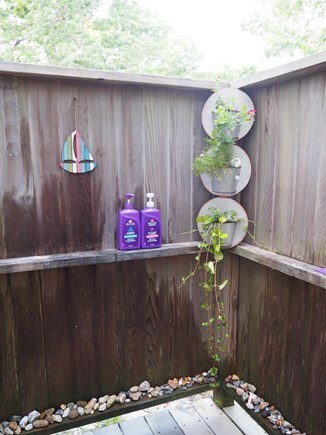 Outside, you will find a private outdoor shower with hot water, a picnic table, a charcoal grill and a ...badminton/volleyball field. Our cottage is NON SMOKING and pets are NOT allowed. 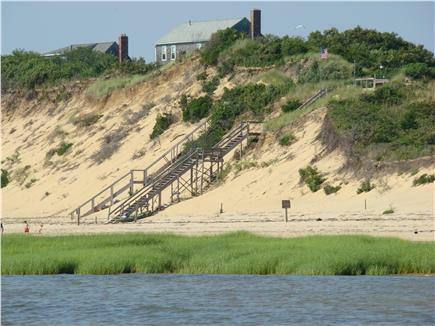 Located in North Eastham, National Seashore beaches are only 10 15 minutes away! The bike trail is nearby too. The town of Orleans, with its large grocery stores and restaurants, is 15 minutes. Eastham also provides several restaurants and shops. My husband and I spent a wonderful week at this beautiful home! So peaceful and comfortable, just what we needed to celebrate our new retirement. We are already talking about our return next season! Our family experienced a very pleasant stay at this cottage. It was very clean, well equipped, and very spacious. We loved the layout and design, with the bedrooms and bathrooms upstairs at each end of the mezzanine, along with a bathroom on the main floor. 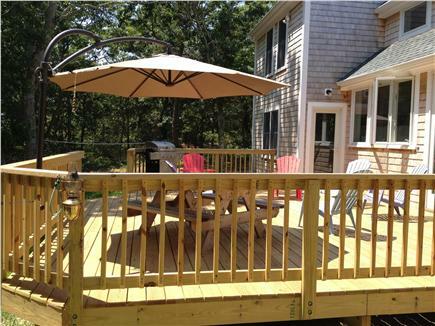 The large deck is great, with plenty of sun, and privacy. The short walk to the beach is so convenient and beautiful sunsets! On top of all this, the owner, Cathy, couldn't be nicer! We are looking forward to another great week this summer! We really enjoyed the bright, open layout of the house, the wooded area by the comfortable, private deck, and the quiet surroundings. The walk to the bayside beach was just right, whether with morning coffee, beach gear, or wine at sunset. A wonderful home! 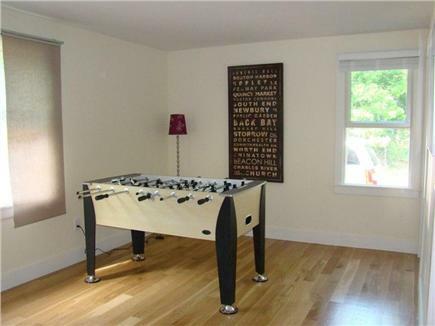 Immaculate and with all the amenities. Private deck/shower. Wooded trail to the private beach with warm bay side water. 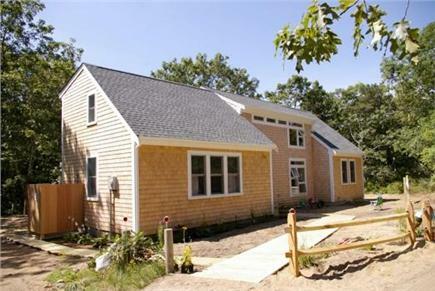 Close to Orleans, Wellfleet and Ptown with lots to see and do. The welcome bag from the gracious owners was a very nice touch. 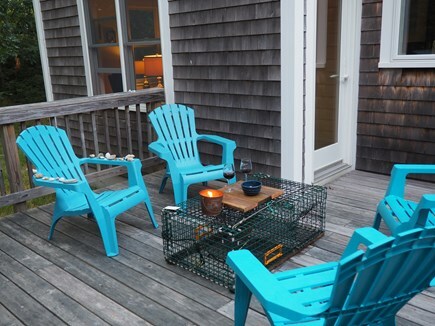 We have rented in North Eastham for 14 years....this is our favorite spot. A slice of heaven on earth! We will definitely return. We were so fortunate to spend a week at 7hydrangeas. It is a beautiful place - just as comfortable and clean as in the pictures. 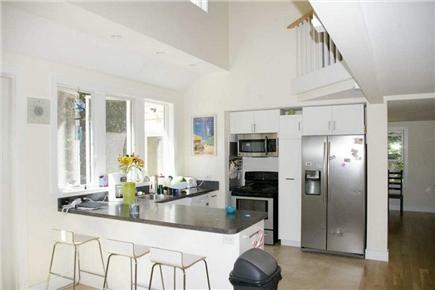 It's a very light and airy house - perfect for us! The walk to the bay beach is charming, and the bay beach is lovely and empty. We enjoyed swimming in the warmer bay water. 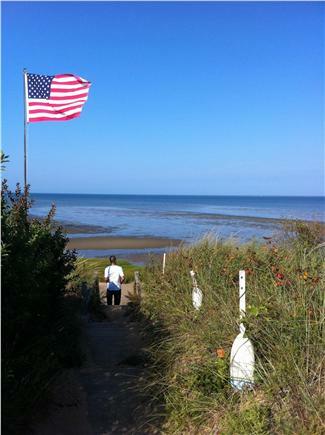 The Cape Cod bike trail is close by, and we enjoyed biking up and down the Cape. We also biked to Nauset Light Beach and Coast Guard Beach. Had a great stay...beautiful clean cottage. Just steps to the beach, perfect for a relaxing vacation! We have been renting houses at the Cape for the last 18 years. We had to make a change because our family has grown. This is by far the best beach location and the cleanest place we have ever rented. 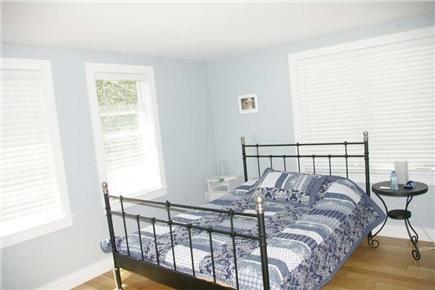 It is well stocked for kids and the way the bedrooms are set up with two master suites is perfect. We had a great vacation and can't wait to return.